Prominent & Leading Manufacturer from Pune, we offer stainless steel dining table. 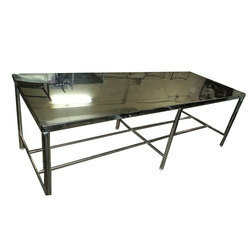 Our organization is listed amongst the leading manufacturers and suppliers of excellent quality Stainless Steel Dining Table. Offered array of Stainless Steel Dining Table is manufactured by our experts in complete adherence with the international quality standards. Further, our respected customers can avail these dining tables from us at competitive prices.